In this three-part series, Dr. Joyce Young calls for a radical new approach to health and employee wellness programs—one that aligns with modern science and gives employees the means to achieve the states of high capacity needed to address today’s demands. 1. See differently. Health is a resource, not a problem—a resource that comes from within and can be strengthened. Read part 1. 2. Act differently. We have more power than we know. Everyone needs their own personal practice for optimizing their health and well-being, and business leaders have a great opportunity to make science-based methods available to their employees. Read part 2. 3. Measure differently. 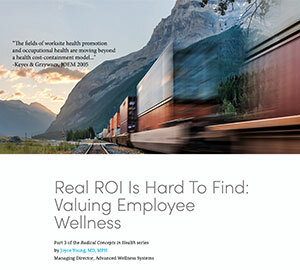 Real ROI is hard to find—until we measure health, not illness. Read part 3.